In the early 2000s, AMD’s Athlon chips rocked the PC market with innovative features like 64-bit processing capabilities, and Intel had to scramble to catch up. Today, the Athlon brand remains alive and well, though AMD’s scrappy underdog reputation has taken a hit as it has lost market share to Intel. AMD wants to rekindle its PC glory days with upcoming Zen chips later this year, and hopes a new Athlon chip will hold the interest of budget-conscious gamers until then. AMD’s new Athlon X4 880K chip is for gaming desktops under $500. The unlocked quad-core chip runs at a frequency of 4.2GHz and can be overclocked, a feature appreciated by gamers. Priced at $95, the new Athlon is among the first chips to come with a custom-made heatsink that AMD calls the Wraith Cooler. Chips mostly don’t have coolers, and the overall package provides more bang-for-the-buck than Intel’s competitive dual-core offerings, AMD claims. Athlon was AMD’s top chip brand during the company’s heyday in the early 2000s, and gamers and enthusiasts loved it for overclocking and other features, said Dean McCarron, principal analyst at Mercury Research. Some of AMD’s best chip innovations came with Athlon. Much like Intel’s Pentium, Athlon is a brand still respected in emerging markets, McCarron said. Athlon 64 in 2003 was the first line of 64-bit chips for PCs. Athlon was turned into a brand for entry-level PCs around 2007, which is when AMD’s fortunes in the PC market started sagging. AMD at the time replaced Athlon with new chip brands for mid- and high-end PCs. 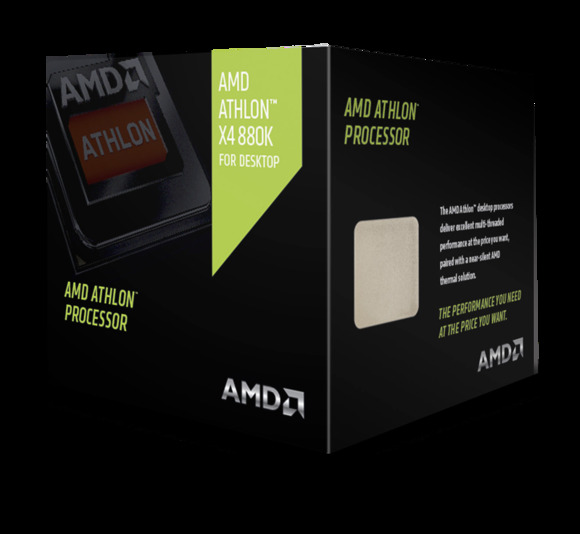 The new Athlon X4 880K is based on the older Godavari architecture, which allows quad-core configurations and overclocking. The gaming chip won’t match AMD’s top-line FX chips on performance, but can be paired with a mid-range GPU to play 4K games at 60 frames per second, Woligroski said. “We may not be the fastest, but we can be extremely capable for the dollar,” Woligroski said. The company opted not to use the latest Excavator architecture for the new Athlon chip, as it provides less flexibility for overclocking and the use of multiple cores — features that address gamer needs, Woligroski said.